Pope Francis has been accused of heresy over his thawing relations with remarried Catholics. 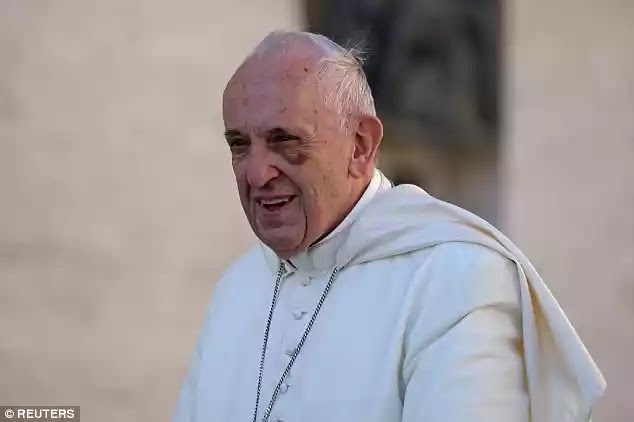 More than 60 priests, theologians and academics have lashed out at the Pontiff in relation to his 2016 opening to divorced and civilly remarried Catholics. In a 25-page letter delivered to Francis last month, the 62 signatories issued a 'filial correction' - meaning brotherly correction - to the pope - a measure they said hadn't been employed since the 14th century. The initiative follows another formal act by four tradition-minded cardinals who wrote to Francis last year asking him to clarify a series of questions, or 'dubbia,' they had about his 2016 text. Francis hasn't responded to either initiative. The Vatican spokesman didn't immediately respond to an email seeking comment late Saturday. None of the signatories of the new letter is a cardinal, and the highest-ranking churchman listed is actually someone whose organization has no legal standing in the Catholic Church: Bishop Bernard Fellay, superior of the breakaway Society of St. Pius X. Several other signatories are well-known admirers of the old Latin Mass which Fellay's followers celebrate. But organizers said the initiative was nevertheless significant and a sign of the concern among a certain contingent of academics and pastors over Francis' positions, which they said posed a danger to the faithful. 'There is a role for theologians and philosophers to explain to people the church's teaching, to correct misunderstandings,' said Joseph Shaw, a spokesman for the initiative, signatory of the correction and senior research fellow in moral philosophy at Oxford University. When it was released in April 2016, 'The Joy of Love' immediately sparked controversy because it opened the door to letting civilly remarried Catholics receive Communion. Church teaching holds that unless these Catholics obtain an annulment - a church decree that their first marriage was invalid - they cannot receive the sacraments, since they are seen as committing adultery. Francis didn't create a church-wide pass for these Catholics, but suggested - in vague terms and strategically placed footnotes - that bishops and priests could do so on a case-by-case basis after accompanying them on a spiritual journey of discernment. Subsequent comments and writings have made clear he intended such wiggle room, part of his belief that God's mercy extends in particular to sinners and that the Eucharist isn't a prize for the perfect but nourishment for the weak.